Burgers, chicken, plantain and sausages are all everyday foods or snacks you can grill. 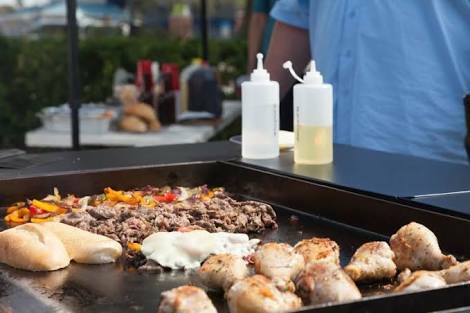 This said, there are some of these unusual foods that you probably didn't know you could grill. Jumia Food shares some of these foods. If you want to try something interesting and different, then you may want to grill watermelon. The heat, smoke and a bit of salt make this sweet fruit unexpectedly tasty and even meaty. Placing cheese directly on the grill boosts its richness and creates a chewy texture. For a perfect result, drizzle the cheese with olive oil, and then grill over medium-high heat. You can serve with bread or grapes. If you want a different taste for sweet potato, then you should try to grill it. It's quick and easy. You simply peel it, slice them, spread olive oil, sprinkle salt, and place on a hot grill. If you think regular pizza is tasty, wait until you try it with the deliciously smoky flavour that comes from cooking it on the grill. You'll never go back to making it in the oven again! Nuts like peanuts, cashews, or almonds can surprisingly and actually be grilled. Grilling adds a nice toasty sweetness to your preferred nuts. You should heat the nuts until toasted and crispy.